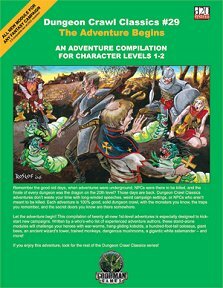 This is a massive collection of low-level adventures, deigned for characters of 1st-2nd level. There are twenty in all, and between them they should provide an opportunity for any party to find their feet and begin to make their names in adventuring circles. Some have appeared elsewhere - The Tower of the Black Pearl was released a couple of years later as an AD&D adventure, for example - but all are inventive and full of challenges. A well-rounded party including characters that can fight, cast spells, heal and play around with things like locks and traps is recommended for all of them. Each adventure comes complete with a few hooks to entice the party in and a complete backstory, as well as useful DM tools such as scaling information, a list of encounters, and notes on specific game mechanics of particular relevance to the game. Then there's a detailed location-by-location description of the adventure itself, complete with integrated notes on who (what) is encountered there and how they are likely to react to the party. Whilst it is, as ever, well worth reading through an adventure before running it, everything you need it is there on the page. Maps, handouts, and notes on further adventures are also provided. Each adventure is stand-alone, which is both a good thing and a bad thing. It means you can select which ones you want to use and run them in whatever order suits your needs - but it does lead to a somewhat fragmented and episodic campaign. You might want to create an overarching setting in which to scatter these adventures, then throw out a selection of rumours and let the party roam the setting, playing adventures as they come to them, and making use of the suggestions for further adventures to develop areas that catch the party's interest. A very useful tool if you want to start a campaign but don't have time to develop one from scratch. Return to The Adventure Begins page.